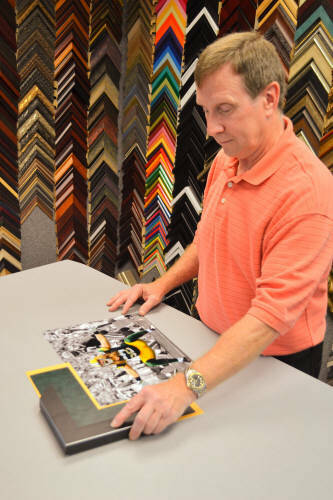 Frame of Mind is a full service picture frame and matting design shop. We customize the framing and matting using the creative talents of our framers. We can frame just about anything. First of all, you will see a large number frame moulding choices on our walls. Before choosing one of those, we will first ask you a few questions about where you want to hang this and do you have any ideas you would like us to show you. From there, we listen to your ideas and answer questions. Many people come into our shop not knowing the possibilities available and ask us just to give them a suggestion as a starting point. Customized framing in not a one size fits all. It is unique and personal. Two of the same prints can come in and leave looking entirely different. Next we look at the item you wish to frame or a grouping of items you wish to enclose in a shadow box display. From there our creative ideas begin to flow. We will find colors and styles to match and compliment your project that reflect your personality and style. Many people know what they don’t like and quickly can say no to one and yes to another design. We offer you the education about your choices so you can make the decision you will be satisfied with. Our ultimate goal is to make you happy and make this a fun and relaxed experience. We will explain the different choices for every aspect of the materials used in framing your project. We utilize acid free materials so that the finished product will stand the test of time. Bob, Tina and Pam will address lighting and the types of glass to ensure the preservation of color. We have the knowledge and experience to give you the best results in finish and the ethics to give you the best options in the price range that fits your budget. Contrary to industry perception, we are not expensive, we are not like the big box stores who mark it up and then discount back to an inflated price. We give you a great value for a reasonable price. Bob often tells his customers, when it comes to a shadow box of memorabilia, he wants it to “tell a story”. He will ask you the story of where these items came from and what makes these special. Then he will suggest how to use those items and photos so that each time someone views your project, you do not have to stand next to them to explain it. We want to capture their interest and appreciation for your mementos and understand what they are about. Look at some of our past customer projects we have shown here under the photos tab. This will give you some idea of the endless creative possibilities. It is not just a matter of putting a frame on something but creating something of a treasure. We have seen many tears of joy when we successfully exceed your expectations. We strive to make every project a personal “WOW”.